PKR’s habitual liar Rafizi Ramli has been sentenced to 18 months in jail for being in possession and publicly disclosing documents that have been classified under the Official Secrets Act, 1972. Rafizi, who is known for repeatedly dishing out lies for the public’s consumption, had been warned on several occassions that he would be committing an offence under the said Act if he chose to disclose the contents of the 1MDB audit report. Rafizi likes to portray himself as a hero and whistleblower when all his employed methods have been going against the various respective laws. 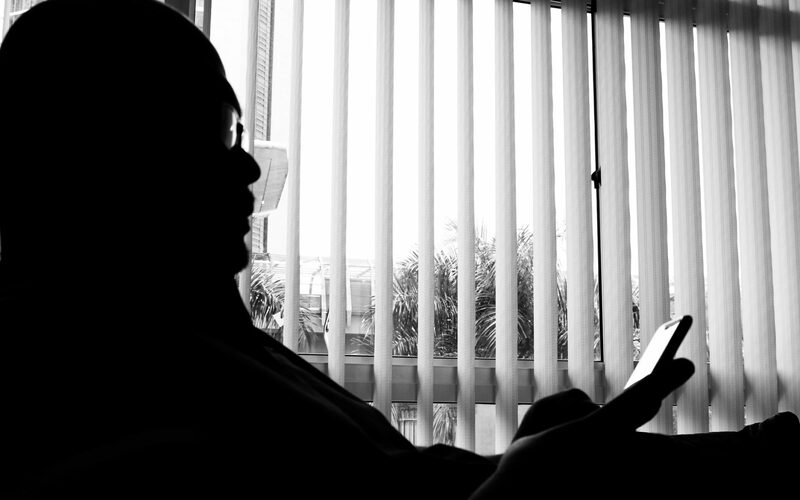 He probably felt invincible when in two previous cases involving the Prime Minister and wife, as well as the Deputy Prime Minister, he got away after the plaintiffs let him off provided he removed slanderous postings from his social media. 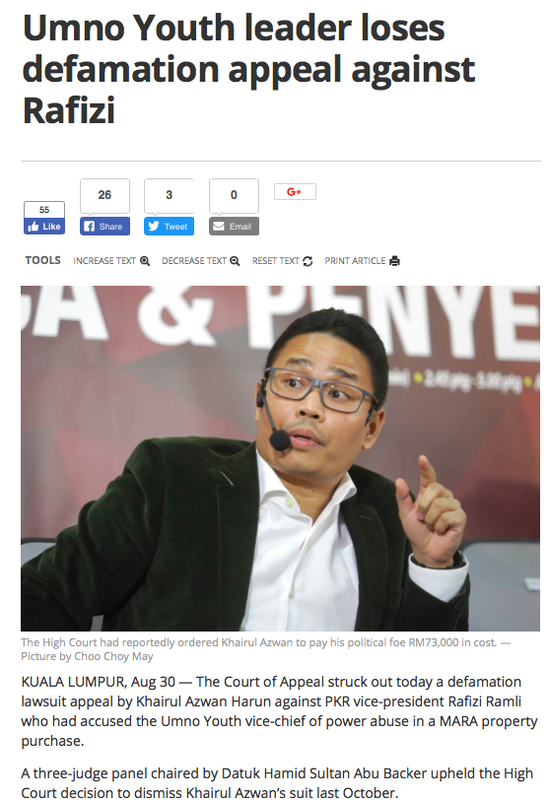 Two weeks ago he was told to pay RM200,000 to the Chairman of the National Feedlot Company and to the Company for defamation. This time around, he has been found guilty in a criminal court and is therefore a convicted criminal. Firdaus Azil of BERNAMA pointed out on Twitter that there are five Opposition lawmakers who have the same report in their possession – two from the DAP, two from PKR and one from PAS, yet none of them have disclosed anything. The five Opposition lawmakers include DAP’s hot-air balloon, Tony Pua, whom, as a member of the Public Accounts Commitee, has been very vocal on the 1MDB issue. Yet Tony has revealed nothing from the audit report. Firdaus asked his followers why hasn’t Tony Pua revealed any of the information he is privy to? The answer he gave is that Tony, as air-head as he may be, is not stupid. Therefore my conclusion is simple: Tony creates all the hullabaloo and lets someone as drama queen and dumb as Rafizi to do his dirty job for him. 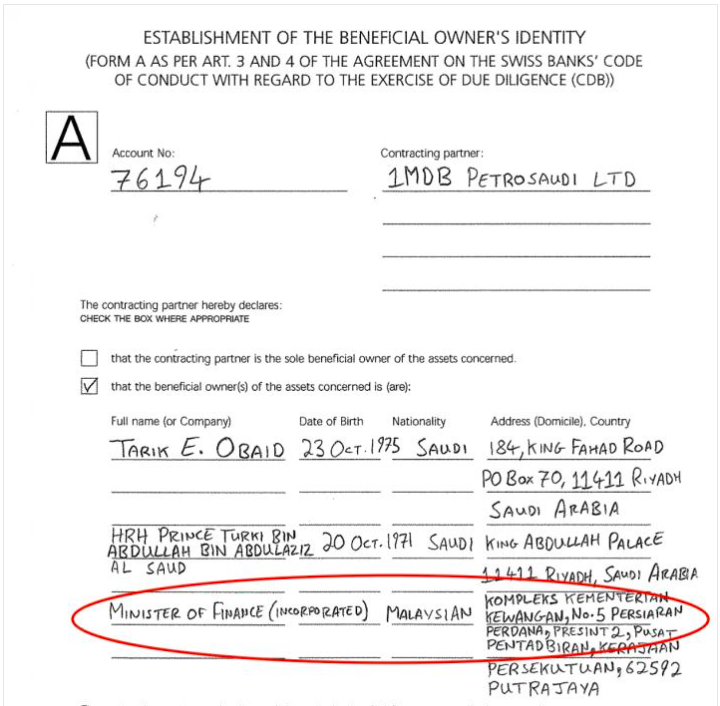 What then is Rafizi if not a Malay barua? 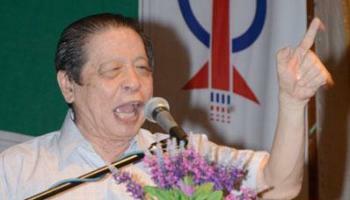 1BestariNet: When Will Muhyiddin Be Investigated? 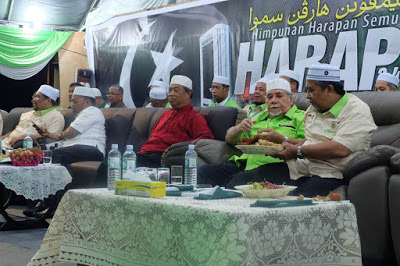 Muhyiddin recently appeared on a PAS platform in Kuala Terengganu to speak about 1MDB etc. He was invited on the capacity of a former Deputy Prime Minister before the formation of Parti Pribumi which he is a pro-tem President. 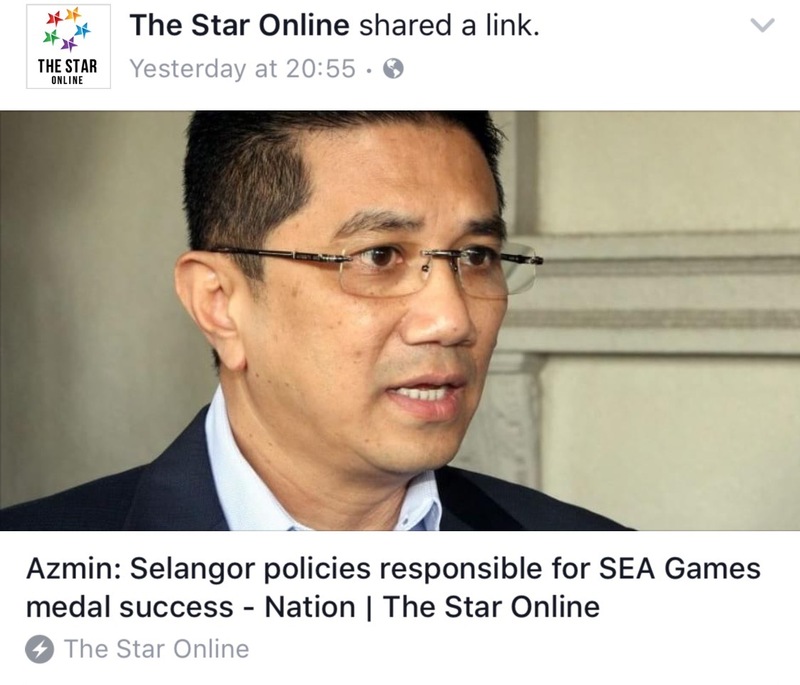 Not once did he address the long-standing question from especially the PAS members – how much did he make from the 1BestariNet scandal? PAS first asked this question back in April 2012. Mahfuz Omar of PAS asked then why was the project not given to known telecommunications players such as Telekom Malaysia, Celcom or TimeDotCom who would be able to provide better Internet backbone to support the project. The 1BestariNet project is a RM4.077 billion project over 15 years to provide 4G Internet connectivity as well as virtual learning environment for 9,924 schools nationwide. YTL, a known favourite of Parti Pribumi’s founder Mahathir, secured a RM663 million package signed by Muhyiddin when he was the Minister of Education. The Public Accounts Committee (PAC) in 2015 concluded that the implementation of the First Phase of the project is a failure. Not even a project steering committee and project technical committee were established at ministry-level to ensure its smooth implementation. the installation of the 1BRIS towers increased the electricity bill for each school by RM120 to RM150 monthly. With YTL’s refusal to pay the RM500 for each 1BRIS tower site, the MoE would have to fork out between RM5.77 million to RM6.92 million each year until the expiration of the contract. 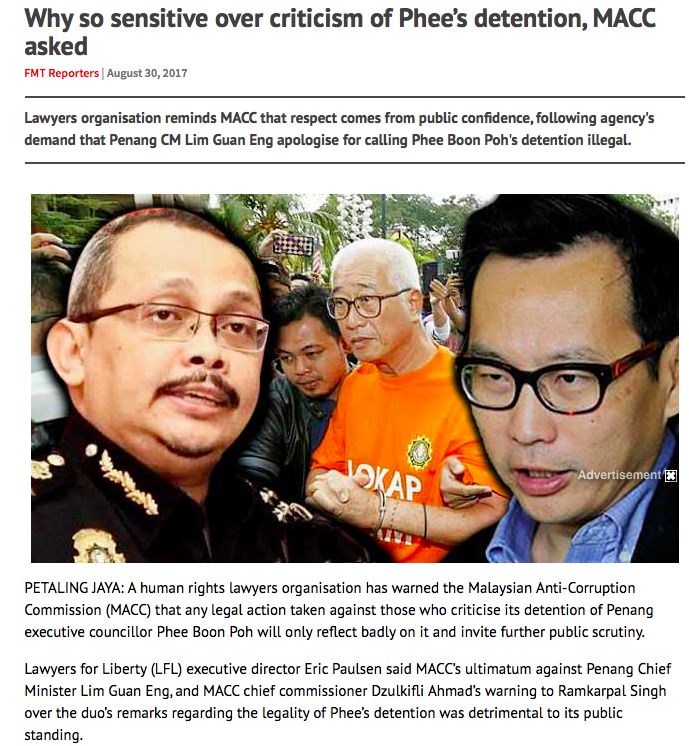 Perhaps the MACC should seriously look into this issue as it has gone almost forgotten. 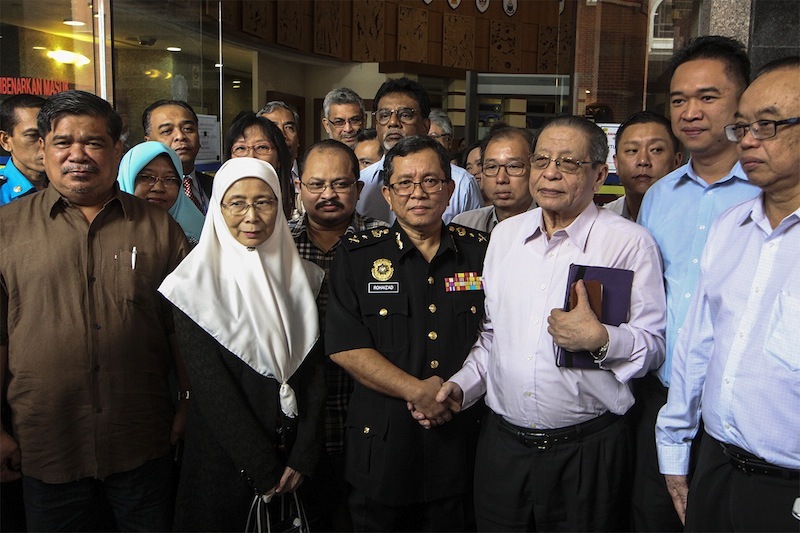 Nabbing errant GLC office-holders may be a good thing, but letting a former senior Minister go free after hunderds of millions tangible rakyat‘s funds have been spent without tangible good results will not go down well with the majority. 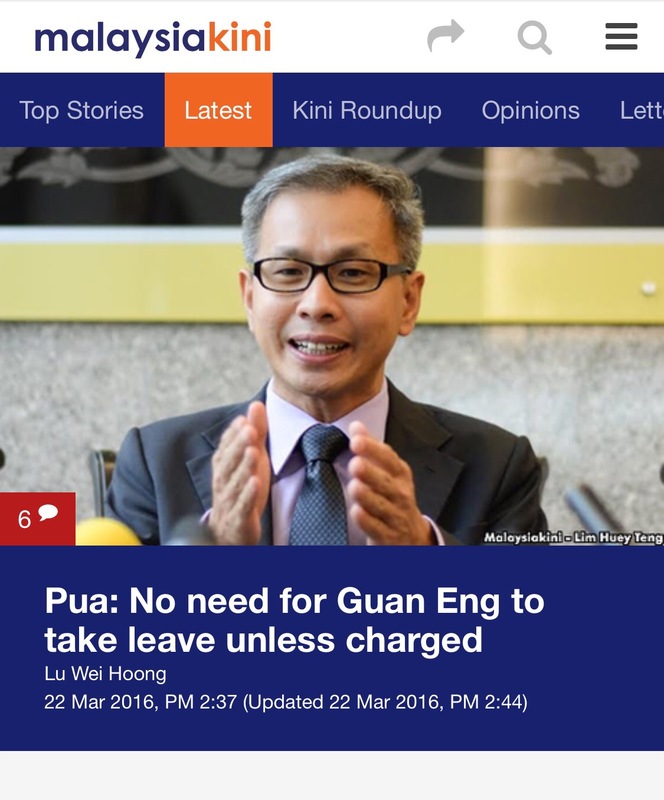 DAP’s Tony Pua is known to many as Tony Puaka as he has the uncanny ability to blurt out stupid and insensible statements. He is known to be a loudmouth who opens his mouth before his brain cells, if any brain at all, could function. In the older days he would be described as “mulut pantat ayam” referring to a certain rear orifice of a hen that is always open. If you think I made this up, you can watch this video of him saying it. 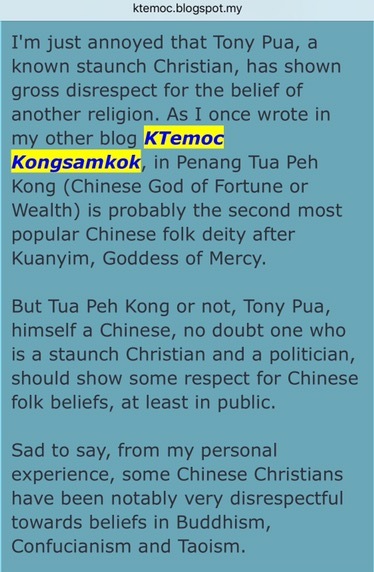 Being a staunch and righteous Christian Tony Pua should not lie and now insist on Lim Guan Eng to go on leave. 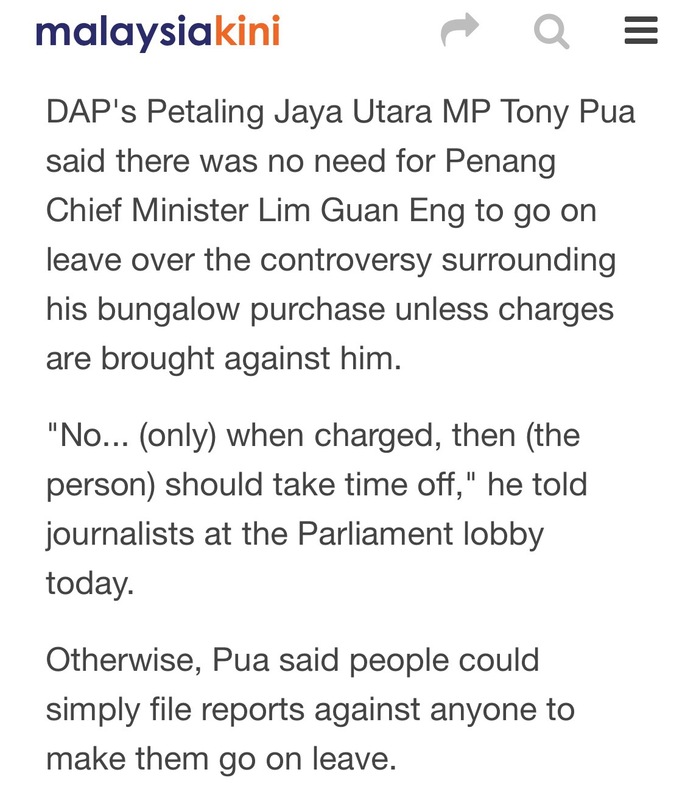 Don’t use stupid excuses such as “this is different as the charges are politically motivated” because it was not any of the Barisan Nasional component parties that asked Lim Guan Eng to make deals with Phang Li Koon, and it certainly wasn’t any of the Barisan Nasional component parties that made Lim Guan Eng pen his signature on those documents. 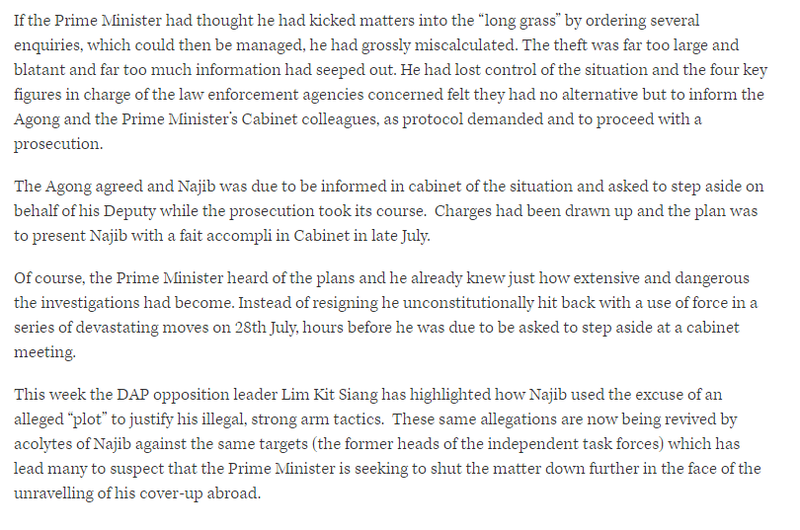 Yet, when Najib was being investigated you made no qualms about asking him to step down until he clears his name. How now, Tony? 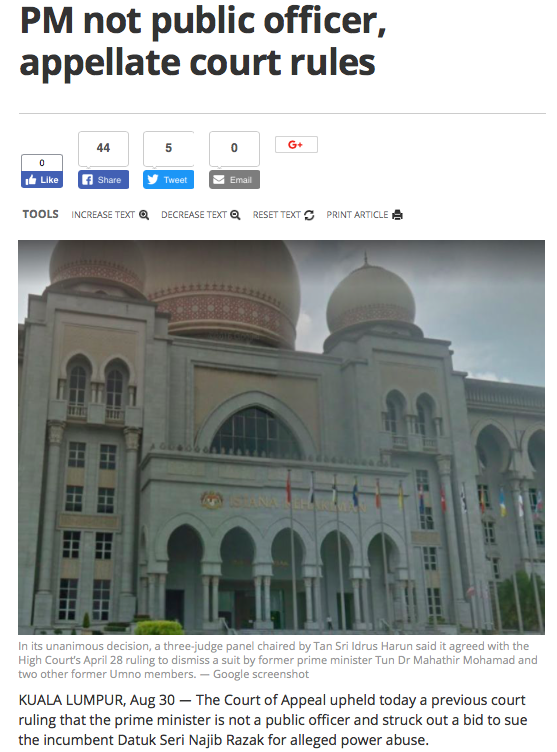 Are you or are you not going to keep to your words and insist on Lim Guan Eng stepping down until the trial process has been exhausted? Or are you, being the PUAKA that you are, going to drop Christianity and Christian values to protect a man, charged for corruption and abuse of power, for political reasons? 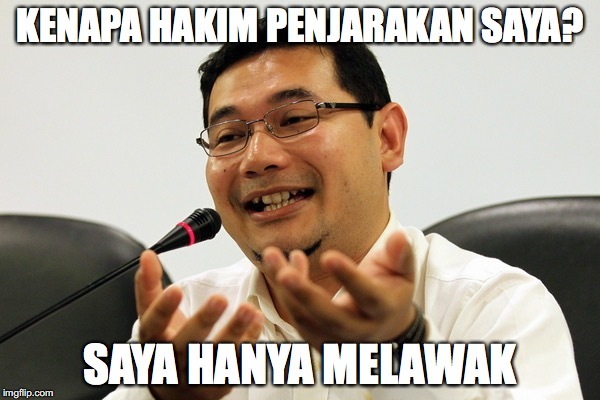 Or are you going to do another Rafizi? 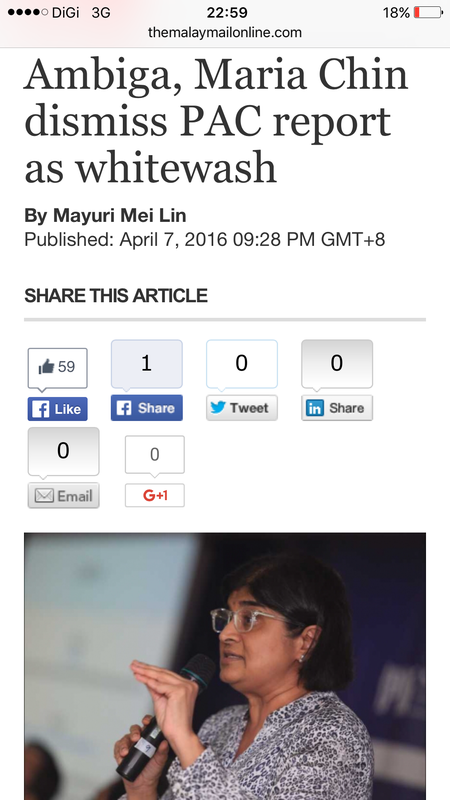 Tony Puaka has just been labelled “PATHETIC” by Ambiga and Maria Chin. 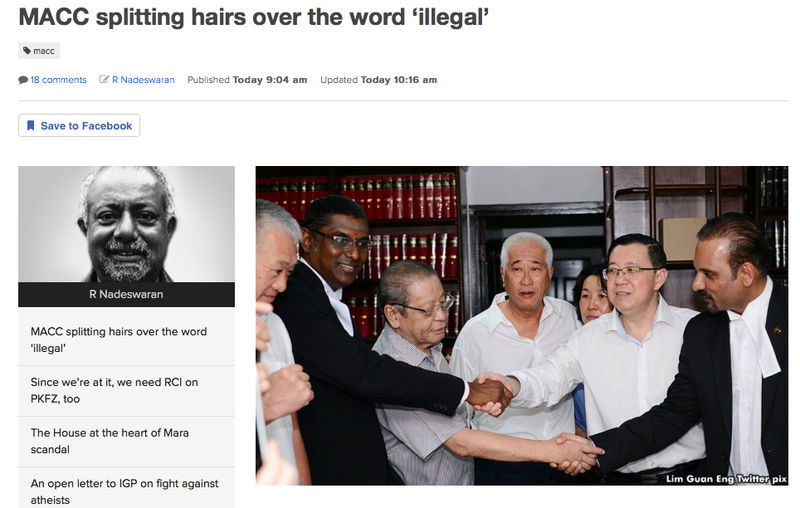 Also labelled as pathetic are other members of the Public Accounts Committee from Pakatan namely its Deputy Chairman, Tan Seng Giaw, Kamarul Baharin Abbas, William Leong Jee Ken, and Takiyuddin Hassan. I’m just trying to imagine Tony Puaka’s reaction to the statement. I can actually imagine it already.